Alby Pool, a pure country voice and genial personality; just two of the reasons why Alby has become a perennial favourite at major festivals like Tamworth. 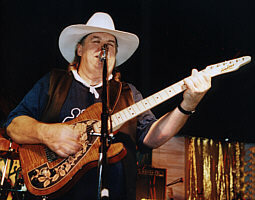 Born and raised in Western Australia, Alby came to prominence with his band No City Limits. Alby is pictured playing a Tomkins Diamondtina II model that also includes a Peizo pickup system.